The chapter begins with a story about high tech sailboat racing that seems to have little to do with the chapter topics. It then starts a discussion about troubleshooting, A page and a half into the chapter, we are finally told that troubleshooting skills should be based on an understanding of the technology being used. Buried the lead a bit, didn't he? Let's get to the point, that you should understand some basic theory about radio waves before we go farther into wireless networking. On page 82, our author begins a lesson in physics about waves. It is a pretty good lesson. He begins with a mental image of a campfire that is producing heat, light, and the sound of a crackling fire. Most people have probably experienced something like this, so it is a good place to start. The author explains that the sound of the fire (or any sound, for that matter) is caused by vibrations which disturb the air around the thing that is vibrating. Those vibrations travel to our ears as waves of pressure that cause our eardrums to vibrate, which causes us to perceive the sound. The critical feature for this discussion is the series of pressure waves that we sense as sound. The author tells us that the light and heat of a fire create waves, but of a different kind. These are not pressure waves. They are electromagnetic waves that do not require air to travel to us. Visible light is the most common electromagnetic wave most of us encounter. The author explains that an electromagnetic wave actually has an electrical component, and a magnetic component, which he illustrates on page 82 as two pulsing waves that are linked, but which are traveling on the same path, rotated 90 degrees from each other. and then back to 0, over and over. This pattern is called a sine wave, after the trigonometry function it resembles. The image above shows us that the waves have a wavelength, the distance a wave travels in one complete cycle. amplitude - The strength of a signal; amplitude is easily understood by turning a volume control up and down on any media player: greater amplitude means louder (stronger signal), lesser amplitude means quieter/softer (weaker signal). In the illustration above, the range of the amplitude is the distance from 0 to the positive peak, or 0 to the negative peak. frequency - When we talk about network signals, we typically talk about electrical signals on copper wire, light signals on fiber optic cable, and radio signals to Wireless Access Points or cell towers. 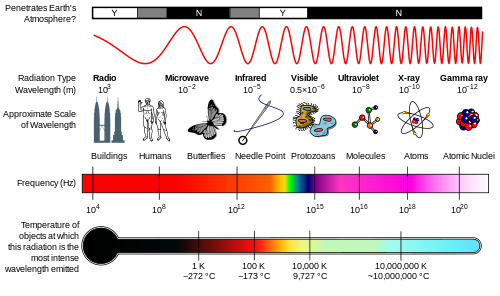 Basic physics for electricity and electromagnetic waves (including light and radio): frequency times wavelength equals the speed of light. (Which makes me wonder what the author was thinking earlier in the book when he said that infrared waves move slower than other waves.) The whole story is a bit more complicated. The speed of light that the text mentions (rounded off to 186,000 miles per second or 300,000 kilometers per second) is actually the speed of light in a vacuum. The actual speed of an electromagnetic wave varies with the medium through which it is passing: air, water, copper, fiber, and other materials each have a slightly different value for the speed of light. This online oscilloscope allows us to see what happens when we change frequency (how many wave cycles occur per second) and amplitude (strength of the signal). Change the frequency with the Frequency slider, change the amplitude with the Gain slider. This oscilloscope allows us to change amplitude, frequency, and wavelength of a signal. Notice that increasing frequency decreases wavelength, and vice versa, because they are inversely proportional. phase - Phase is harder to understand until you see a representation of a wave, like the sine waves shown in the examples so far. Let's look at another online oscilloscope to get a better idea of the concept. Returning to the last oscilloscope, we can change from a sine wave to a cosine wave, which is like what happens when we change the phase of the wave, causing the part that is generated next to be different from what is expected. Four phases of a sine wave are: rising from 0 to positive peak, falling from positive peak to zero, falling from zero to negative peak, and rising from negative peak to zero. A cosine wave has the same parts, but a cosine wave begins at the top of a positive peak, and a sine wave begins at zero rising to the positive peak. Looking at the values above, you should be able to imagine that the cycles of a sine wave and a cosine wave are offset by one quarter of a cycle. This is why shifting from one to the other is an effective way to simulate changing the phase of the wave. 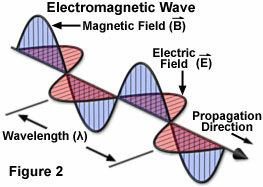 In the terminology used in the text, the two waves described above are 90 degrees out of phase, one quarter of a cycle. The text moves on to inform us that the electromagnetic energy we have been considering could be any form of radio wave, microwave, infrared wave, visible light wave, ultraviolet wave, x-ray, gamma ray, or any other example of such radiated energy. If you examine the diagram on page 88, you will see that I just named several different kinds of electromagnetic radiation that are all in the same family. You could say they are all different kinds of light, but you could just as well say they are all different kinds of waves. The only difference, really is in the frequency and wavelength that defines each one. The text gives us the impression that the spectrum has a beginning and an end, but it really does not. This version of similar information from Wikipedia names a few more categories. The text also presents us with a list of frequency ranges on page 90 that it calls bands. These particular bands are all contiguous. Several more bands are listed on this page in Wikipedia. (It is a bit large to reproduce here.) Note that the ITU, the IEEE, and governmental agencies all have their own band designations. The image below summarizes some of these. More detail is available at the page I just mentioned. When you refer to a band, you may need to know the right system to use for your audience to understand what you mean. The text discusses modulation of analog and digital waves. We should understand both of those words, since we have already talked about modulation. analog - Analog events have an infinite number of values within an operational range. Think of a hose connected to a water faucet. We can turn the hose on full force, or turn it off, but we can also turn it to any imaginable value between those two states. A dimmer switch on a dining room light is like that, too. It can be turned to its brightest setting, it can be turned off, or it can be turned to any setting in between. Sound waves are like that. Human ears can often hear a sound wave if it has any value between 20 Hz and 20 KHz, including fractional values. This is why some people who love recorded music prefer to listen to it in an analog format, which can reproduce every variation made by the original musicians. digital - Digital events have defined states, like on and off, and they cannot be in any state in between. Digital waves are like that. They are often shown as square waves that have peaks and troughs, but have only abrupt, instant transitions between the two states. The text moves on to discuss five methods that are used to measure radio frequency (RF) signals. milliwatt (mW) - The author tries to help us understand electrical pressure (voltage) by comparing it to water pressure in a pipe. I find his method to be distracting. Let's try it like this. The power of a wireless signal is created in an electrical circuit that uses wires, so standard electrical theory applies at the point of origin. The basic power level in the circuit is measured in volts. The symbol for it is V.
The wires in any circuit resist the flow of electrons to some degree. This resistance is measured in ohms. The symbol for it is R (for resistance). The power flowing through a circuit is also measured in watts. The symbol for watts is often P.
There are a thousand milliwatts in a watt. Either unit can be used to measure power in a circuit. decibel milliwatt (dBm) - This section of the text is rather confusing. It requires that you understand something that the author has not really explained. We have just discussed milliwatts, but what are decibels? A decibel is a tenth of a Bel, which is a unit that was used to measure power in telephone systems. (Guess who it was named for.) A decibel is not a real unit, like a volt or a watt. It is a way of comparing two things, like the signal strength of a transmission and the noise that is interfering with it. The video below explains that it is "a logarithmic expression of the ratio of two power levels". The lecturer says we multiply 10 times the log of the ratio of two power levels. So, what is a log? Well, a logarithm, in general, is the exponent that some base number has to be raised to, in order to get another number. In the case of decibels, the base number for our logarithms is 10. So, let's assume we have two power levels that we can call P1 and P2. If P1 is twice the value of P2, the ratio P1/P2 gives us 2. We can feed that to a calculator that understands log 10, which means log to the base 10, and we get .30102999. That is the exponent we have to raise 10 to, in order to get 2. You can see that a ratio greater than 1 will give us some positive dB, and a ratio less than 1 (some fraction) gives us a negative dB. You will also see that larger and larger ratios give us give us larger and larger dB values, but the increases are not linear, which is what an exponential scale is all about. Huge values will be expressed as numbers that fit on a scale that humans can perceive. So, what is a dBm? It is a ratio of two power values, converted to a logarithm, with reference to to a milliwatt. After confusing us for a couple of pages, our author mentions something that agrees with the table in the video. A loss of 3 dB is about the same as a ratio of 1 to 2. A gain of 3 dB is about the same as a ratio of 2 to 1. A loss of 10 dB is about the same as a ratio of 1 to 10. A gain of 10 dB is about the same as a ratio of 10 to 1. The text calls these facts the rules of 10s and 3s in RF math. The third measure relates specifically to a wireless signal. A Receive Signal Strength Indicator (RSSI) is a measure that is taken by a wireless NIC to determine if it is in range of a wireless signal. The IEEE tells us this measure is not absolute because it is implemented differently by various NIC manufacturers. The value used for the top end of the scale varies from one vendor to another. Nice to know about it, but not much value in that one. See the next bullet for a better option. Percentage - a refinement on the use of RSSI is to show the current RSSI signal strength as a percentage rather than as an integer. This makes the values more comparable from one maker to another. Signal to Noise Ratio - Signal and Noise are both measured in decibels, which means that they are both logarithmic values. Why do we care? We care because when we divide an exponential quantity by another exponential quantity, we don't divide, we subtract. The text defines noise as "unwanted signal components". Where does it come from? Some noise is caused by background noise, signal elements generated by the equipment itself. It can also be caused by radio frequency interference (RFI) which can be caused by the medium picking up actual radio signals or radio frequency emissions from any equipment that makes them. The text discusses a major source of noise, electromagnetic interference (EMI) which can come from generators, power lines, electric devices, and from other communication lines. In addition to noise being added to the line, the signal itself tends to fade out as it travels over the line. The general phenomenon is called attenuation, which is explained as fading over distance. Electricity-based signals can fade due to the resistance (impedance) of the wire being used. The signals can also be distorted, as discussed in a few pages, to the point where we can no longer use the signal. We typically measure the power/strength of a signal and the power/strength of the noise on a line in decibels (dB), which, as you now know, are measured on a logarithmic scale. Logarithms are exponents, so when we calculate the ratio of signal to noise we actually subtract the noise decibel rating from the signal decibel rating. The decibel rating is an exponent of a base level, so where we would normally divide, we subtract the exponent of the noise from the exponent of the signal, giving us the relative signal strength. We can count on noise increasing over distance. Suppose a signal is generated at 80 dB. It attenuates (fades) by 10 dB per kilometer. If there were no other factors, the signal would fade to nothing within 8 kilometers. However, we are told that there is a noise level of 20 dB on the line from the start, lowering the effective signal to noise ratio to 60 at the point of signal generation. This would move the effective length of the medium to 6 kilometers. There is more. The noise on the medium increases by 5 dB per kilometer. The signal fades over distance, and noise increases. In this case, the signal is useless at 4 kilometers. Even though the signal strength is still 40%, the noise strength matches it at that point. The maximum operational length for the medium could be shorter yet if the receiver needed the signal to noise ratio to be something more than just "greater than zero". The last major topic in the chapter is about things that go wrong with radio frequency signals. The text discusses several problems that complicate sending and receiving wireless signals. It refers to them as propagation behaviors, which happen because waves are typically sent out in all directions and they encounter several kinds of hazards. Free Space Path Loss (FSPL) - This is the result of natural attenuation, the fading of any signal over distance.